Auxilium Secondary School, Itanagar to represent state in regional level science drama competition will be held at Guwahati. The Auxilium Secondary School, Gohpur Tinali won the State Level Science Drama Competition which was held at the Arunachal Pradesh Science Centre at I G Park here today. 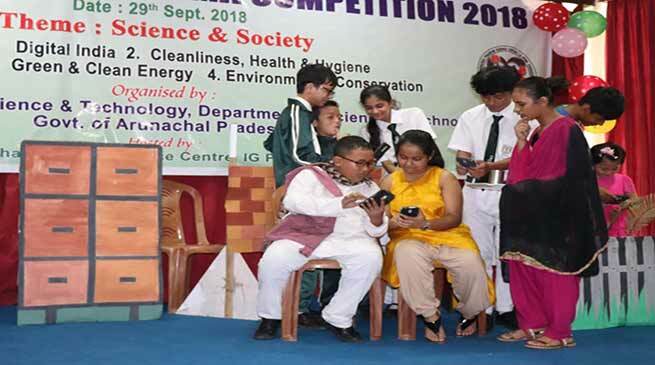 The competition, with the theme ‘Science and Society’, was organised by the Arunachal Pradesh State Council for Science & Technology, department of Science & Technology, wherein 10 schools from across the Capital Complex participated. The competition aimed at highlighting the pertinent issues of modern times like environmental degradation, clean energy, digital technology and cleanliness and sanitation. The Auxilium Secondary School will represent the state in the regional level Science Drama Competition which will be held at Guwahati. The school received a trophy, certificates and a cash award. Government higher secondary school Arunodaya, Itanagar, and Delhi Public School, Itanagar, bagged the second and third position respectively and was awarded a cash prize, trophy and certificates. Individual awards for best director was adjudged to Abhijit Kr Varma (VKV Nirjuli), Best Script Writer to Atum Muang (VKV, Itanagar), Best Actor to Shuken Bui (Delhi Public School, Itanagar), and Best Actress to Rimee Tilling Bamin. The prizes were distributed by Arunachal Pradesh State Council for Science & Technology deputy director P Lombi, IPR assistant director Radhe Tajung and Arunachal Press Club general secretary Tanom Jerang, who attended the event as judges. Earlier, addressing the gathering, chief guest for the event Arunachal Pradesh State Council for Science & Technology Bamang Mangha underscored the importance of science and technology in today’s time. He also encouraged the students to take up creative activities like drama which he said helps in personality development of a student. APSC & T Director T Mungyak, Science Centre Curator Dr. Vivek Kumar, senior officers, teachers and students from various school of capital complex among others were present on the occasion.